There are many different ways to look at published school data. We want parents to understand what aspects to consider, and provide a straightforward guide to looking at and comparing key data. Here, we will also proudly share our ‘headline’ data for Hillside Primary School. ‘Attainment’ data relates to how children score compared to children nationally. However, attainment is only one part of the picture. ‘Progress’ allows for a measure of impact whatever the initial and end attainment points might be. For example, a child who began with scores very much lower than the national average, and leaves with scores above the national average can arguably be said to have made above expected progress. The other thing to consider is the ‘groups’ that children are deemed to fall into. These allow the government, parents and carers to compare performance on a more like-for-like basis. In addition to an ‘All Children’ group, a range of other categories also exist. The government requires schools to compare, for example, the performance of children from different economic backgrounds, those who speak English as an additional language, those on the Special Educational Needs Register and many other aspects. Children at Hillside Primary School regularly score very highly in relation to national averages and expectations and outcomes for children are ‘Outstanding’. This is a testament to the whole school community. All Leaders, including governors, focus relentlessly on raising standards throughout school, our parents are supportive, and our pupils are resilient, determined and strive to be the very best they can be. 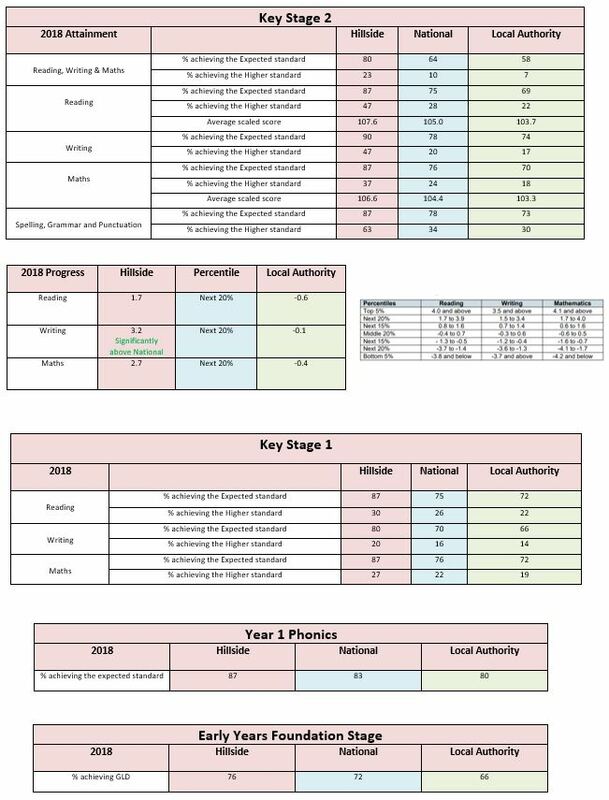 Hillside Primary School consistently scores very highly, across a whole range of subjects and groups, in terms of both attainment and progress. See below for our data and performance summary from the most recent full academic year (2018).